Have you wandered around places looking for the perfect blouse? Have you tried looking at your local market but couldn’t find one? Does your tailor laugh at you when you mention your need? Ready-made blouses can be unicorns so that’s why we made you this list. Vamas is a wonderful store that has everything from plain blouses to stretchable and even crop tops. Starting at INR 900 and going up to INR 16,000 (for intricate handmade designs with mirror works on them), you can either order them online or if you’re in a hurry, they have stores in Chembur, Dombivali, Thane and Vashi. We often find ourselves in a fix when it comes to blouses. The long process of choosing the cloth, explaining it to the tailor and picking it up eats up a considerable amount of our Netflix time (seriously why can’t we just pass off sports bras as blouses?) Ready-made blouses are a blessing in this case and the one we found at Manish market are more so. The designs and colours are neutral and will match with majority of saris or lehengas. You can just walk into the different lanes of the market and spot tailor shops with beautiful ready-made blouses hung on hooks. Starting at INR 900, Milap Matching Centre is quite popular with the ladies in the central part of the city. They have your plain jane blouses and the fancy ones too. You can carry your clothing and they will help you find the closest matching shade. 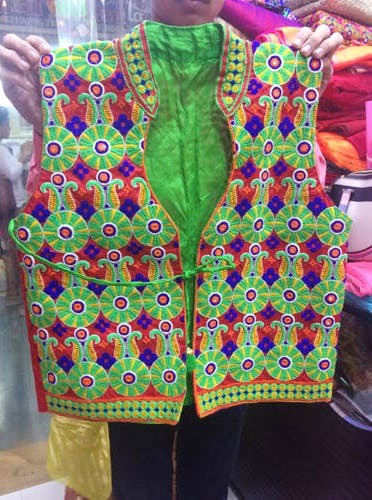 A popular outlet for ethnic wear, Jashn has outlets across the city. Their blouses range between INR 500 and INR 1500, and they have a huge collection to choose from. You can find them at Viviana Mall in Thane too. One of the oldest shops for blouses near Dadar Station, they have their collection starting at INR 140 for the basic ones. If you want the golden ones, they’ll come for INR 300. We picked up three blouses for INR 800 and they still rock it! Shrimati Matching Centre knows how to entice its audience by hanging some of their best blouses right at the entrance to invite you in. Their blouses start at INR 800 and can go up to INR 5,000, so be prepared to pick and choose the right one for you.